At the end of orthodontic treatment, patients expect to have a perfect smile with well-aligned, bright teeth despite the fact that many factors work against the latter. For example, enamel loss during bonding and debonding procedures makes the color of the yellowish dentin become more apparent, or the surface irregularity caused by the cleaning procedures changes the light reflection and alters the color of the teeth.,,,,, While color change during or after orthodontic treatment is difficult to avoid, repeated bonding, either to ameliorate the orthodontic result or as a result of patient-related factors increases the risk of discoloration. Repeated bracket bonding is often required in patients presenting parafunctional oral habits or Class II, Division 2 malocclusion where upper incisors interfere with the lower incisor brackets. It may also arise from imprecise bonding technique, continuation of the former dietary routine, or inaccurate bracket placement. Some authors believe that if the brackets are bonded in a suboptimal fashion, rebonding the bracket is a better way of finishing the case because a tooth's ideal tip, torque, height, and rotation lie in the bracket, and cannot be achieved by placing compensatory bends on the archwire., For example, approximately 2° of torque deviation may result from only 0.5 mm of vertical positioning error. Therefore, for any preadjusted bracket to express its predetermined tip and torque values, a full-sized archwire and accurate positioning of the brackets are of critical importance. Concerning this matter, Carlson and Johnson advised a reset session after waiting for 6–8 weeks with a full-sized archwire to reevaluate the crown and root alignment and improve bracket-positioning errors. There are many studies in the literature focusing on the effects of repeated bonding, most of which aim to investigate the effects of bracket rebonding on shear bond strength,,,,, or choice of bonding agents for higher shear bond strengths. This study is the first to show if repeated bonding results in color changes as it necessitates multiple acid-etching and adhesive remnant cleaning procedures. The color determination in dental practice is an important subject both for manufacturing more aesthetically pleasing restorations and to quantitatively determine the amount of color change between 2 time points. There are two ways to determine the color of a tooth; one is visual examination which is subjective and limited as the human eye is not sensitive enough to detect subtle color changes. The second one is performing a colorimetric analysis using a standardized color-quantifying device which is highly reproducible and objective.,, These devices not only aid in determining the color of a tooth for restorative purposes but also enable the clinician to calculate the amount of color change between 2 time points while giving statistically evaluable data. Therefore, the aim of this study was to investigate the effects of repeated bracket bonding on enamel color changes by means of colorimetric measurements after in vitro external and internal coloration. This study was approved by the Institutional Review Board of Başkent University (Project No: D-KA 14/06). The power analysis indicated that a statistical significance of at least a 0.2-unit difference in terms of ΔE (ΔE = total color difference) at 85% power and 5% error could be reached when 25 samples were included in each group. Assuming possible sample loss during the procedures, 27 teeth were assigned to each group. Eighty-one human premolars without any presence of caries, fractures, microcracks, white spots, and demineralization areas were collected in a saline solution for the study. After cleaning the teeth with fine pumice slurry, the roots were cut from the cementoenamel junction line with a tapered diamond bur. The teeth were then embedded in acrylic blocks with the buccal surfaces parallel to the floor. Water-resistant black and circle-shaped tapes with a 3 mm × 3.5 mm rectangular opening in the center were applied on the middle third of the buccal surface to standardize the enamel surface intended for analysis. The tapes were further secured on the crown with cyanoacrylate glue, as described by Eliades et al., to avoid contamination of the bonding surface. The samples were then code-numbered for identification and randomly divided into three groups. Samples in Group 1 (G1) represented nonorthodontic treatment patients and were left untreated. Samples in Group 2 (G2) and Group 3 (G3) represented orthodontic treatment patients with no repeated bonding and brackets bonded 3 times, respectively. Brackets (Mini-Twin™, Ormco Corporation, Orange, California, USA) were bonded using the conventional approach; 30 s of etching with 37% phosphoric acid gel (3M™ Unitek, Monrovia, CA, USA) followed by thorough washing for at least 15 s and drying with air-water syringe of the dental unit. Then, a thin layer of primer (Transbond™ XT Light-cure adhesive primer, 3M™ Unitek, Monrovia, CA, USA) was applied on the surface, and brackets were bonded with adequate amount of composite material (Transbond™ XT Light-cure adhesive paste, 3M™ Unitek, Monrovia, CA, USA). LED photopolymerization (3M™ Elipar™ S10, 3M Unitek, Monrovia, CA, USA) was accomplished on each aspect (mesial, distal, coronal, and apical) for 5 s each and as a total of 20 s.
Samples in all groups were then immersed in four different staining solutions – black coffee (Nescafe® Classic, Nestle, Switzerland), red wine (Maculan Pino and Toi, Breganze, Italy), orange juice (Tropicana Pure Premium® [no pulp], Chicago, Illinois, USA), and coke (Coca-Cola®, Atlanta, Georgia, USA), each for 24 h to simulate external discoloration and were gently rinsed with distilled water before passing to the next solution. To simulate the effects of natural aging and internal discoloration, the samples received 24 h of artificial photoaging with a light-emitting apparatus (Suntest CPS plus, Atlas More Details material testing technology, Gelnhausen, Germany) at a 24-h continuous irradiation of 50.000 kJ/m2, corresponding to an illuminance of approximately 135.000 Lux at 400 nm, induced aging equivalent of exposure to sun irradiation in Central Europe for 30 days. These procedures (96 h of staining solution bath and 24 h of photoaging) constituted 1 cycle and was repeated 3 times for all samples. During this sequence, brackets were debonded once in G2 after the third cycle of coloration and debonded and rebonded 3 times after each cycle in samples in G3 [Figure 1]. A debonding plier (3M™ Unitek, Monrovia, CA, USA) was used to remove the brackets, and adhesive remnants were cleaned with 12-fluted tungsten carbide burs (G and Z Instrumente, Lustenau, Austria) mounted on a low-speed, water-cooled contra-angle. Following that, the buccal surfaces of the teeth were polished with polishing paste (Clinpro™ Prophy Paste, 3M™ Unitek, Monrovia, CA, USA) and rubber cups for 20 s.
Color assessment was performed using a hand-held spectrophotometer (SpectroShade Micro, MHT, Verona, Italy) and according to the CIE Lab system (Commission Internationale de l'Eclairage, L*, a*, b*). Each measurement was repeated 3 times, and average value of these 3 measurements was calculated to minimize the margin of error. Spectrophotometric color measurements were performed at baseline (T1) and after 3 cycles of internal and external coloration (T2). The SpectroShade was calibrated according to the manufacturer's instructions. All measurements were performed by the same investigator. Special cylindrical blocks encapsulating the samples and having the same outer diameter with the diaphragm of the SpectroShade were used to ensure that all the measurements were taken from the same area with the same angle. The black tapes also served for the same purpose and restricted the area of interest to the same 3 mm × 3.5 mm area every time. The ΔE values derived from the two colorimetric analyses were compared between the groups with a one-way analysis of variance with debonding/rebonding sequence as the discriminating variable. Paired t-test was used to determine whether significant differences existed between the ΔE values within each group. Intraexaminer reliability was calculated using intraclass correlation coefficient (ICC) at 95% confidence interval. Significance was predetermined at P < 0.05 for all statistical tests (SPSS for Windows, version 22.0, SPSS, Chicago, IL, USA). Three samples, 2 from G2 and 1 from G3, had to be excluded from the study. In 2 samples, total enamel loss was observed during bracket debonding. In the other sample, the black tape was damaged severely exposing the enamel surface excessively; therefore, it was also excluded assuming that T1 and T2 assessments could not be performed on the exact same enamel window. The ICC values for repeated measurements are shown in [Table 1]. All values are above 0.9, indicating high reliability. [Table 2] shows the mean and standard deviation values of ΔE between first (T1) and second (T2) colorimetric analyses. According to the P values, differences in color changes were statistically significant within groups; yet, similar between groups. The CIE Lab system is regarded as the standard colorspace, and in this system, the arithmetical difference between two color values is expressed as ΔE., In the study by Johnston and Kao, color differences (ΔE) below 1 unit was shown to be indistinguishable by the human eye. As for ΔE values between 2 and 3.7 ΔE units, the difference is clinically perceivable but still acceptable. However, ΔE values of 3.7 units and above represent the unacceptable color changes under clinical conditions. Besides, these long-known values, Paravina et al. described two new threshold values after conducting a thorough, multicenter study. In their article of 2015, they set the 50:50 perceptibility threshold at 1.2 ΔE units, which is the ΔE value at which 50% of the observers could visually detect a color difference, and 50:50 acceptability threshold (AT) at 2.7 ΔE units, that is, the ΔE value at which 50% of the observers believe that the color difference is clinically acceptable on visual examination. When the results of this study are evaluated from the clinical perspective, ΔE values for G2 and G3 exceeded the AT value; however, none of them reached the threshold for clinical detection when the threshold value is set at 3.7 ΔE units. Therefore, it can be concluded that the effect of orthodontic treatment, with or without repeated bonding, results in a color change that is perceivable by the observer but still acceptable. The results of this study suggest that the color difference was similar between the groups (P > 0.05) and repeated bonding does not alter the color of the tooth any more or less than single bonding. However, this does not necessarily have to mean that repeated bonding procedures do not affect the color parameters at all. In other words, some steps may result in an increase in the ΔE value, while others result in a decrease, working antagonistically and neutralizing the color change. For example, pumicing, adhesive remnant cleaning, and polishing steps are well-defined for removing enamel tissue and making the dentinal color more apparent during orthodontic treatment.,,,,, On the other hand, acid-etching creates a whitish, matte appearance which can be observed clinically with the naked eye. Besides these, almost every step mentioned above changes the surface topography of the enamel tissue and creates a rough surface. Studies have shown that rough surfaces have an increased contribution of surface-localized, random specular reflections which create an opaque, whitish appearance.,, Since these steps were performed 3 times in G3, it is fairly normal that repeated bonded surfaces present even more roughened and uneven surface topography. Even though there was no statistically significant difference between the groups, the color changes in G2 and G3 over the time period were slightly greater than that of G1. Therefore, on a hypothetical basis, it can be concluded that orthodontic treatment results in a color change which is different from the natural aging of the tooth. In this study, the exposure time to staining solutions and ultraviolet light was designed to be 120 h because as reported by Stober et al., only 24 h of artificial coloration is too short to observe the color changes. In addition to this, many studies are conducted without keeping the samples in a staining solution, but only distilled water.,,, Therefore, this study has an advantage of better mimicking the oral environment by enabling the absorption of food colorants, yet still lacks the simulation of saliva and mechanic abrasion caused by tooth brushing. To observe the long-term effects of repeated bonding on enamel surfaces a fourth staining and photoaging cycle, and a third colorimetric assessment could have been performed. Repeated bonding results in a similar amount of color change when compared to single bonding and is not a risk factor for enamel discoloration during orthodontic treatment. We would like to thank Dr. Sercan Akyalçın for his contribution to the study. This study was approved and funded by the Institutional Review Board of Başkent University (Ankara, Turkey) (Project no: D-KA 14/06). Diedrich P. Enamel alterations from bracket bonding and debonding: A study with the scanning electron microscope. Am J Orthod 1981;79:500-22. Sandison RM. Tooth surface appearance after debonding. Br J Orthod 1981;8:199-201.
van Waes H, Matter T, Krejci I. Three-dimensional measurement of enamel loss caused by bonding and debonding of orthodontic brackets. Am J Orthod Dentofacial Orthop 1997;112:666-9. Eliades T, Kakaboura A, Eliades G, Bradley TG. Comparison of enamel colour changes associated with orthodontic bonding using two different adhesives. Eur J Orthod 2001;23:85-90. Chung KH. Effects of finishing and polishing procedures on the surface texture of resin composites. Dent Mater 1994;10:325-30. Karamouzos A, Athanasiou AE, Papadopoulos MA, Kolokithas G. Tooth-color assessment after orthodontic treatment: A prospective clinical trial. Am J Orthod Dentofacial Orthop 2010;138:537.e1-8. Gorelick L, Geiger AM, Gwinnett AJ. Incidence of white spot formation after bonding and banding. Am J Orthod 1982;81:93-8. Millett DT, Hallgren A, Cattanach D, McFadzean R, Pattison J, Robertson M, et al. A 5-year clinical review of bond failure with a light-cured resin adhesive. Angle Orthod 1998;68:351-6. Creekmore TD, Kunik RL. Straight wire: The next generation. Am J Orthod Dentofacial Orthop 1993;104:8-20. Alexander RG. The vari-simplex discipline. Part 1. Concept and appliance design. J Clin Orthod 1983;17:380-92. Carlson SK, Johnson E. Bracket positioning and resets: Five steps to align crowns and roots consistently. Am J Orthod Dentofacial Orthop 2001;119:76-80. Bishara SE, VonWald L, Laffoon JF, Warren JJ. The effect of repeated bonding on the shear bond strength of a composite resin orthodontic adhesive. Angle Orthod 2000;70:435-41. Bishara SE, Laffoon JF, Vonwald L, Warren JJ. The effect of repeated bonding on the shear bond strength of different orthodontic adhesives. Am J Orthod Dentofacial Orthop 2002;121:521-5. Nicolás AI, Vicente A, Bravo LA. The in vitro effect of repeated bonding on the shear bond strength with different enamel conditioning procedures. Eur J Orthod 2010;32:291-6. Rüger D, Harzer W, Krisjane Z, Tausche E. Shear bond strength after multiple bracket bonding with or without repeated etching. Eur J Orthod 2011;33:521-7. Ishida K, Endo T, Shinkai K, Katoh Y. Shear bond strength of rebonded brackets after removal of adhesives with Er, Cr: YSGG laser. Odontology 2011;99:129-34. Eslamian L, Borzabadi-Farahani A, Tavakol P, Tavakol A, Amini N, Lynch E, et al. Effect of multiple debonding sequences on shear bond strength of new stainless steel brackets. J Orthod Sci 2015;4:37-41. Grünheid T, Larson BE. Repeated bracket bonding: Conventional or self-etching primer? J World Fed Orthod 2014;3:102-5. Johnston WM, Kao EC. Assessment of appearance match by visual observation and clinical colorimetry. J Dent Res 1989;68:819-22. Buyukyilmaz S, Ruyter IE. Color stability of denture base polymers. Int J Prosthodont 1994;7:372-82. Rinke S, Hüls A, Kettler MJ. Colorimetric analysis as a means of quality control for dental ceramic materials. Eur J Prosthodont Restor Dent 1996;4:105-10. Atlas Suntest Bulletin. Atlas material testing solutions. Gelnhausen, Germany: Corporate Bulletin; 1998. Bureau Central de la Commision Internationale de l'Eclairage (CIE). Recommendations on Uniform Colour-Spaces, Colour Difference Equations, Psychometric Colour Terms. Supplement No. 2 to CIE Publication No. 15. Paris: CIE; 1978. p. 9-12. Boncuk Y, Cehreli ZC, Polat-Özsoy Ö. Effects of different orthodontic adhesives and resin removal techniques on enamel color alteration. Angle Orthod 2014;84:634-41. Leland A, Akyalcin S, English JD, Tufekci E, Paravina R. Evaluation of staining and color changes of a resin infiltration system. Angle Orthod 2016;86:900-4. Jahanbin A, Ameri H, Khaleghimoghaddam R. Effect of adhesive types on enamel discolouration around orthodontic brackets. Aust Orthod J 2009;25:19-23. Wee AG, Monaghan P, Johnston WM. Variation in color between intended matched shade and fabricated shade of dental porcelain. J Prosthet Dent 2002;87:657-66. Hasegawa A, Ikeda I, Kawaguchi S. Color and translucency of in vivo natural central incisors. J Prosthet Dent 2000;83:418-23. Paravina RD, Ghinea R, Herrera LJ, Bona AD, Igiel C, Linninger M, et al. Color difference thresholds in dentistry. J Esthet Restor Dent 2015;27 Suppl 1:S1-9. Hosein I, Sherriff M, Ireland AJ. Enamel loss during bonding, debonding, and cleanup with use of a self-etching primer. Am J Orthod Dentofacial Orthop 2004;126:717-24. Eliades T, Gioka C, Eliades G, Makou M. Enamel surface roughness following debonding using two resin grinding methods. Eur J Orthod 2004;26:333-8. Zarrinnia K, Eid NM, Kehoe MJ. 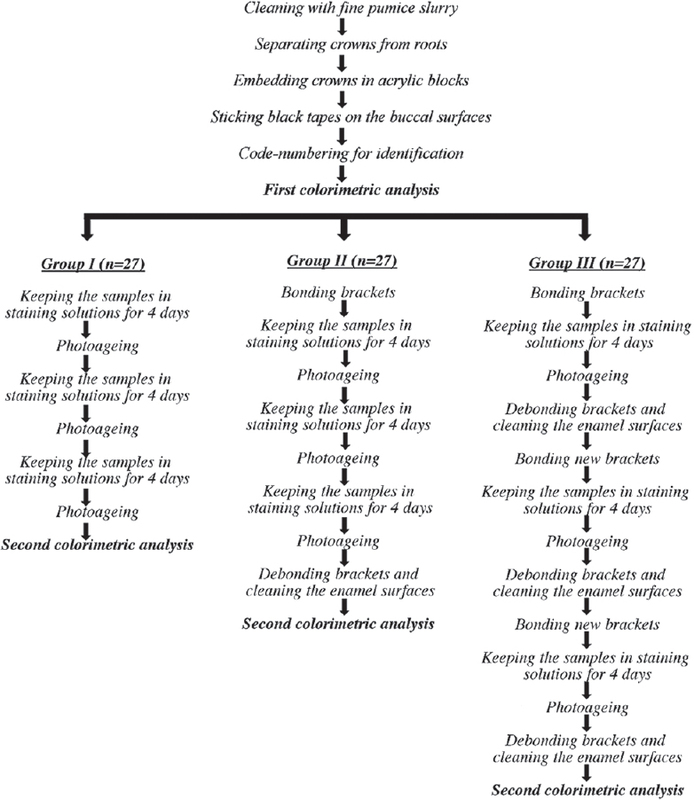 The effect of different debonding techniques on the enamel surface: An in vitro qualitative study. Am J Orthod Dentofacial Orthop 1995;108:284-93. Inokoshi S, Burrow MF, Kataumi M, Yamada T, Takatsu T. Opacity and color changes of tooth-colored restorative materials. Oper Dent 1996;21:73-80. Stober T, Gilde H, Lenz P. Color stability of highly filled composite resin materials for facings. Dent Mater 2001;17:87-94. Eliades T, Gioka C, Heim M, Eliades G, Makou M. Color stability of orthodontic adhesive resins. Angle Orthod 2004;74:391-3. Trakyali G, Ozdemir FI, Arun T. Enamel colour changes at debonding and after finishing procedures using five different adhesives. Eur J Orthod 2009;31:397-401. Davis BA, Friedl KH, Powers JM. Colour stability of hybrid monomers after accelerated aging. J Prosthodont 1995;4:111-5.